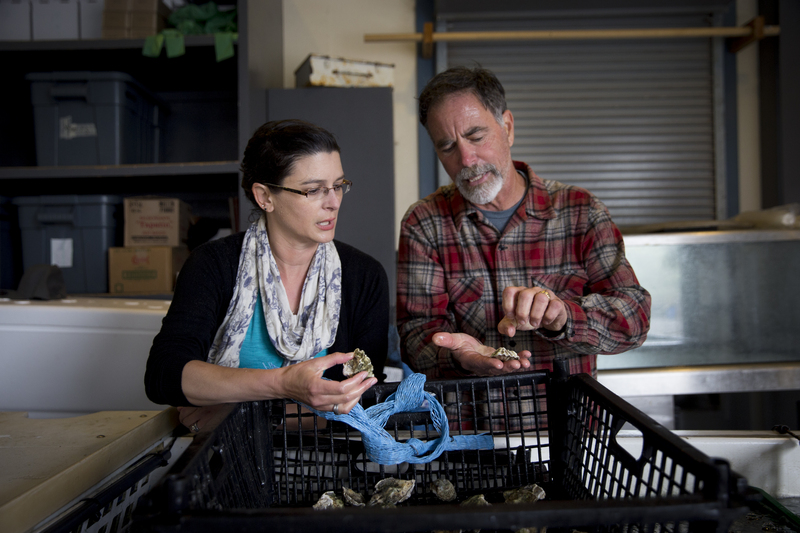 In the early days of ocean acidification research, experiments were simple, says benthic ecologist Jim Barry. Some involved plopping fish into containers of high-carbon seawater. This sort of lab test allowed researchers to observe animals’ physiological responses to our ocean’s changing chemistry. That line of inquiry may start in the pages of scientific journals, but it leads somewhere more intimate: our dinner plates. About a decade ago, workers at an Oregon oyster farm began to notice that the baby oysters weren’t doing so well. The die-off of spats, as they’re called, happened around the same time that the farm, located in a coastal wetland, was experiencing unusually acidic seawater conditions. 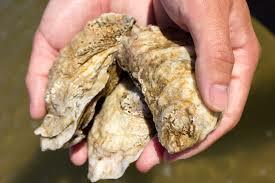 Shellfish farmers suspected more acidic ocean waters were slowing the development of young oysters. Photo courtesy NOAA. They suspected that the water’s increased acidity—in this case, due to an upwelling of deep coastal water—was harming the oysters. Coastal upwelling is a seasonal occurrence along the U.S. West Coast. But the effect is magnified when paired with ocean acidification, a global trend caused by people burning fossil fuels. Hill’s lab has raised mussels and oysters in tanks designed to simulate ocean conditions 100 years from now. Under these more corrosive water conditions, she says, the animals tend to be smaller, with thinner shells, and are more susceptible to predators. 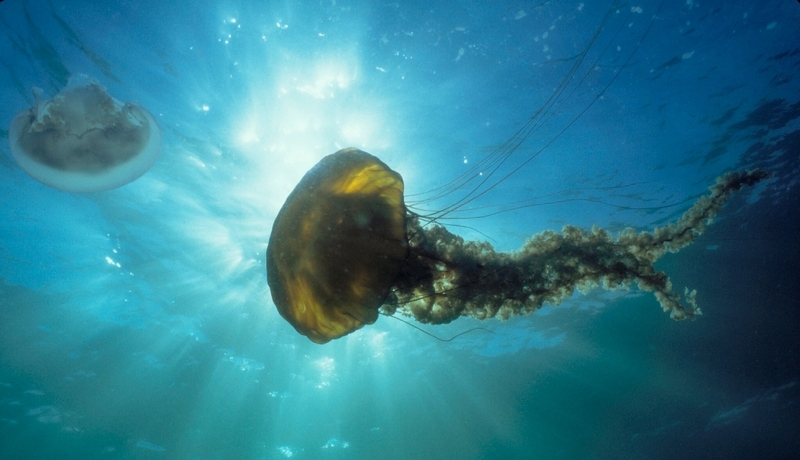 The science suggests that shelled zooplankton like pteropods (swimming snails), krill (tiny crustaceans) and foraminifera (amoeba-like animals) will struggle to survive in an acidifying ocean. Running experiments on fish in jars of carbonated water has one strong advantage: Scientists can tinker with the water’s pH level while controlling for other variables, providing confidence that the changes they observe in the fish are a direct result of the changes in acidity. Teasing apart the impacts of our greenhouse gas emissions on complex ocean ecosystems, with all their interacting parts, is a bigger challenge. Scientist Andre Boustany outfits a Pacific bluefin tuna with a tracking tag to better understand its migrations. Andre Boustany, Nereus Principal Investigator for Fisheries at Monterey Bay Aquarium, says that complexity is no reason to doubt that climate change and ocean acidification are happening. Scientists are quite certain about the basic mechanisms of both. When people burn oil, coal and natural gas, we take carbon that’s been locked up underground for millions of years and release it into the air, causing Earth’s atmosphere to thicken and trap more of the sun’s heat. The ocean absorbs at least 80 percent of this extra heat, which dramatically slows the pace of global warming on land. (Thanks, ocean!) But it also triggers a cascade of notable impacts including sea-level rise, more powerful storms, shrinking sea ice and coral bleaching. There are other, more subtle effects. As ocean water warms, many species are shifting their geographic ranges toward the poles or farther offshore, in search of cooler digs. Others are getting squeezed vertically—forced to move up or down the water column as warming surface water, which can’t hold as much oxygen, causes low-oxygen zones to expand. Warming also jacks up metabolic rates, forcing animals to spend more energy on basic survival. In the wild, that can lead to smaller, skinnier fish. Sardines school in the Aquarium’s Kelp Forest exhibit. Ocean warming may prompt some fish species to move toward cooler waters. Ocean acidification, dubbed “climate change’s evil twin,” is even more cut-and-dry. The ocean absorbs not only heat, but also much of the extra carbon dioxide we’ve pumped into the atmosphere. This triggers chemical reactions that reduce the water’s pH. The increased acidity makes calcium carbonate molecules—the building blocks of shells, skeletons and coral reefs—harder to come by. That’s just chemistry. Chemical changes in the water may also be affecting fish behavior. In one study, young reef fish exposed to higher carbon dioxide levels exhibited riskier behaviors, like swimming in the direction of predators they’d normally avoid. These disturbances can ripple through ocean food webs, affecting animals and ecosystems in ways scientists are just beginning to decipher. With so many variables in play, how can scientists help us prepare for a future ocean that’s warmer and more acidic? Boustany points to two primary tools: global trends, based on data going back as far as 100 years; and global models, projecting forward as far as a century. Through this wide lens, he says, we have reason to worry about the future of wild seafood. In the ocean, low-productivity areas—like deserts on land—are getting bigger. Fish populations across the globe are producing fewer surviving offspring. A fishing vessel heads to port in Moss Landing, Calif. Climate change may make fish more abundant along the U.S. West Coast. That’s not to say that every fish will struggle to survive, or that the entire ocean will become a blue desert. It’s easy for highly migratory fish like tuna and swordfish to swim a little farther to find lunch, Boustany says. Fish may become more abundant in the California Current along the West Coast, as climate change drives winds that generate upwelling, bathing the surface in nutrients that can spark population booms. Meanwhile farmed fish may get plumper, because warmer water paired with abundant feed causes growth spurts. The ocean provides much of what’s needed to support human life on our planet, from oxygen to food. Like schooling fish, we tend to come together in the face of big threats. As fossil fuel emissions warm and acidify the ocean, collaborations are emerging to protect the blue realm that covers 70 percent of our planet, produces half the oxygen we breathe and provides one-sixth of the animal protein we eat. Sustainable seafood groups, including Seafood Watch, are taking a closer look at the connections between greenhouse gas emissions and seafood production. Governments and nonprofits have joined together to form a new problem-solving network, the International Alliance to Combat Ocean Acidification. Simple choices, like using public transportation, can help slow the pace of climate change. On an individual level, each of us makes daily decisions—like what to buy and how to travel around—that affect the pace of climate change and ocean acidification. We can slow that pace by reducing our own carbon footprints in simple, satisfying ways, like nurturing our backyard gardens and driving less. It’s also important to encourage climate-forward policy changes by asking our elected representatives, from local to national levels, to step up and take action. This article first appeared in the Fall 2017 issue of ConWatch, the quarterly magazine of the Garden Club of America.